Sonic skin cleansing brushes are my new boring girl beauty pick of the year! Especially when it comes to my face, because my hands aren’t efficient to remove all the dirt from my face. Nor is a face cloth, if I’m being honest. I’m a simple girl, a boring girl, if you please. I don’t want a lot of steps to my skin cleansing routine. I know I’m not alone. Every morning, I wash my face with oil. Yes, that’s right, oil. I’ve been doing it for years, and I love it. After finding Korean konjac sponges, I thought the combination was fantastic. It didn’t last long. Although, I do enjoy the sponges, they don’t last long. They break apart easily. Just, not a cost effective option for giving my face a solid cleaning. Also not helpful for the rest of my body, or my feet. One afternoon I was actually sitting around watching television, which isn’t the normal routine for me. Anyway, while sitting there, I saw a commercial for a facial brush. Listen, I’m not a beauty expert, so I’d never seen a facial cleansing brush before. Once I did see it, I hopped onto Google to try and find one. Do you know how much those things cost? I quickly decided I’d have to give that dream up, because it just didn’t make sense to pay over $100 for a good facial cleansing brush. Then, fate stepped in! I was asked to check out a much more budget friendly trilogy of sonic skin cleansing brushes found at CVS. Winner, winner, chicken dinner, my friends. CVS isn’t the first place most people think to look for top notch beauty products, I get it. However, when you’re simple, and boring, like I am, it’s actually a great place to score awesome goodies in my budget. Granted, I was sent the three sonic brushes, but all of them are in my budget. Trust me, they’re not going to break your budget up, either. 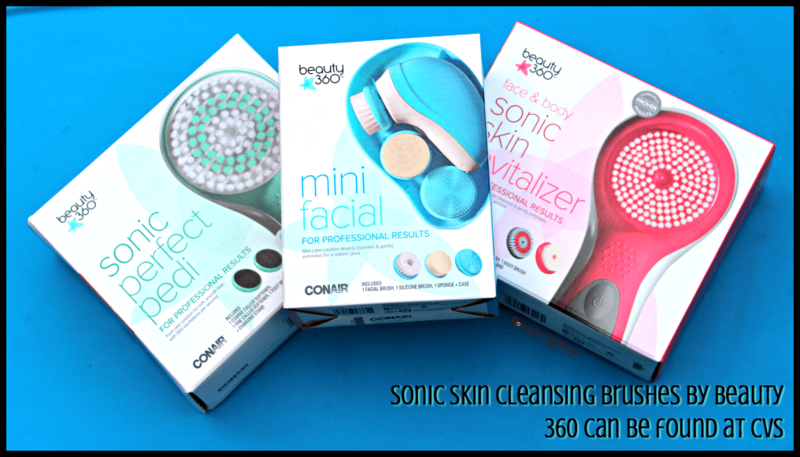 I’m most excited about the Beauty 360 Sonic Skin Revitalizer, because of the option to use it on your face. No more relying on a wash cloth, or gross sponge. It’s easy to clean, and it’s easy to use. It takes a little longer in the bathroom, just because I have to go a little slower around my face. I find if I go slower, I don’t press the brush into my face as hard. It’s supposed to be gentle, lightly brush your face. I’m learning, and I love how much clearer my skin is after using it for just two weeks. Using it for my entire body? It takes too long. The brush head is just tiny, and even though I’m petite (meaning short,) I’ve got a lot of body to cover in the shower. One shower in the house, four people who use the shower. You do the math. There’s just not enough time to use the sonic skin revitalizer every time I shower. Once in a while I’ll bring it in there, but for the most part, I just stick to the face brush. Love to do my own manicures, as well as, pedicures. I’ve used many pedicure products over the years, and I like most of them. What’s unique about the Beauty 360 Sonic Perfect Pedi is that it’s easier to use than most of the others I have tried. Switching out the coarse callus softener, to the fine callus softener, and then to the foot brush. It’s a simple swap out, and when you’re in the shower, it’s nice to be able to quickly swap out the heads. The fact that it doesn’t require batteries, is another bonus. Having it sit on a charger, so I can just grab it, sounds silly, but again, I’m a simple girl who likes a beauty regime that’s not complicated. Grab and go, and super fast. Just because I’m a simple girl, doesn’t mean I don’t want to feel beautiful every day, you know what I mean? Travel. I do it more often these days, now that my little sunflowers are a bit older. When I travel, I only pack a carry-on, which has its limitations. However, the benefits far outweigh the limitations in my eyes. When I go away, my oil for my face travels with me, of course. I keep my routine as regular as possible, because one false move and BOOM, I’ve got mountains all over my face, and it’s painful. Acne is a killer for me, which is unfair at my age. UGH. Keeping my routine is important, so having a cleansing brush to travel with is now a necessity. Thankfully, the Beauty 360 Mini Facial Skin Care System is small, and easy to fit into my carry-on! I find the more comforts from home I can bring when I travel, the more I enjoy my time traveling. It’s worth the small expense for this little bad boy, for sure. What’s your favorite skin cleansing brush for your face? Your body? Your feet? Let me know in the comments below, and please, give these goodies a try. Inexpensive, but the results are top notch!